Posted on Thursday, May 15th, 2014 at 2:31 pm. The guy behind the hottest new restaurant in town is no newbie to the Livermore Valley dining scene. Posada’s Catering has been serving his delicious food at Livermore Valley wineries since they opened in 2005. 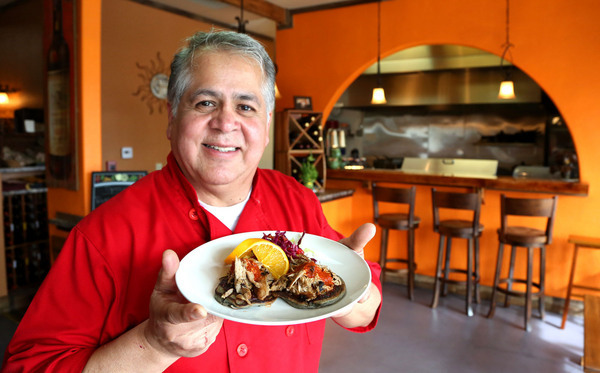 With all of Eduardo’s catering popularity, it is no surprise he has opened a new Southwestern-themed restaurant. It is one of the only restaurants of its kind in the Bay Area. Here we discuss his inspiration and experience. At the age of 25 I had my first chance to work along Frank D’Angelo and Richard Olivero. Frank was an Italian chef with a lot of knowledge and knows many shortcuts in preparing food. Richard showed me the Southwestern flair, he had great presentation but lacked flavor. This is when I realize I could do this and could always go to my mom for a point of reference in her flavoring. The DNA of the land. When you have good soil you will get good grapes, good vegetables and so on. Pairing a wine that is not ready to be open. This is where you will need to add, subtract or substitute an ingredient from a complete dish. Dinner. After a long day, I like to sit down and get served. Shrimp cakes, they are simple, easy to make and very yummy. My mother. I wish I could have her touch in cooking.